Maisie PriorA Bangor University graduate’s final year dissertation has been ‘highly commended’ in the Music, Film & Theatre category of The Undergraduate Awards Programme 2017. 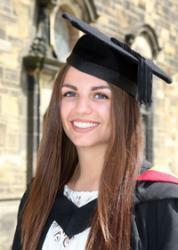 Maisie Prior, 23, originally from Enderby, Leicester, graduated in July 2017 with a first-class BA Spanish with International Experience degree, whilst also scooping the Dr John Robert Jones Prize of £1,000 which is awarded annually to the best students across all disciplines at the University. Maisie's submission was an adaptation of her final year dissertation, highly acclaimed by the External Examiner for Spanish, Professor Duncan Wheeler of the University of Leeds. Professor Wheeler was especially impressed by the depth and academic quality of Maisie’s work, entitled ‘Seeing through the Severed Eye: The Cinema of Buñuel as a Mirror for Nietzsche’s notion of The Death of God’, claiming that it was the best piece of work he has ever seen at undergraduate level at any British university. Professor Wheeler suggested that Maisie should submit her dissertation to The Undergraduate Awards - the world’s leading undergraduate awards programme which recognises top undergraduate work, sharing this work with a global audience and connects students across cultures and disciplines. The Undergraduate Awards assembled a panel of experts from around the world to assess the entries submitted to Music, Film & Theatre, and they have been diligently working to narrow them down to the very best of those submitted. Maisie’s submission was ranked in the top 10% of all submissions to Music, Film & Theatre, and she is now in the running to be the Global Winner of this category, which will be announced on September 19th. This year, The Undergraduate Awards received 6,432 submissions from students in 299 Institutions across 47 countries. As a Highly Commended Entrant of The Undergraduate Awards, Maisie’s work has now been identified as among the best undergraduate coursework globally. During her time at Bangor University, Maisie produced outstanding academic work, and her engagement with university life went above and beyond expectations. She was also awarded the B-Enterprising Enterprise and Innovation Award, BEA 200, UK Higher Education International Unit-sponsored prize for the best ‘Yarn’, runner up in UCAS/The Times Love Learning competition, Santander Universities Enterprise Award and a Santander Mobility Grant. Maisie is currently studying a PGDE in Spanish with French at The University of Sheffield, for which she have been awarded a British Council Scholarship of £27,500. Ultimately, in the future she hopes to do a PhD in Modern Languages Education, inspired by her volunteer work for the Welsh MFL Mentoring Scheme.